Who are the heroes of Richards Street? They are the men of FDNY Ladder Company 101 who took their final ride through the Brooklyn Battery Tunnel on the morning of Sept. 11. All seven of them, the entire shift of officers and firefighters, received their orders and raced into the south tower of the World Trade Center, the second tower to be targeted by a hijacked airliner. Less than an hour after it was hit, the 110-story building collapsed as their brothers from Engine 202, awaiting orders on the street below, narrowly escaped death by diving into a covered garage. The bodies of firefighters Terrence McShane, Brian Cannizzaro, and Thomas Kennedy have been found. Two of the men were found close to one another, the third was found a short time later in the same area. Lt. Joseph Gullickson and firefighters Patrick Byrne, Salvatore Calabro and Joseph Maffeo are still missing. These men are the heroes of Richards Street (fathers, husbands, brothers, sons and uncles) they were fun-loving, athletic, inventive and romantic. As thousands evacuated the burning towers, firefighters charged up flights of stairs, knowing they faced imminent danger. What does it take for someone to do this? "Courage, dedication and above all else, a willingness to lay down your own life so that others can live," says retired Ladder 101 firefighter Jim Lortz. "That's exactly what these men did on that horrible day." An estimated 25,000 lives were saved on Sept. 11 because of rescuers like the Heroes of Richards Street. Lt. Joseph Gullickson, 37, was a 13-year FDNY veteran, having previously served as one of New York's finest. "He knew everything," says Lt. Mike Delgrosso of Ladder 101. "He was the best drill giver that we had." A firefighter from Engine 202 says the lieutenant was a good leader, and always there for his men. He lived on Staten Island and played basketball in the FDNY league. Gullickson loved books, history, music, and dogs, especially his Rottweiler, "Lucy." He also loved his family, and was extremely devoted to his wife, Naomi, and his two daughters, Amanda, 3, and Isabel, 1. The Gullicksons would have celebrated their fifth anniversary on Sept. 28. In a cruel twist of fate, two days after Gullickson's memorial service on Nov. 12, his wife suffered another equally devastating blow. Her father was killed in the crash of Flight 587 in Queens, N.Y.
Salvatore Calabro, 38, had just finished his shift on Sept. 11 when the first plane hit. He could have gone home to Staten Island, but instead he jumped on the truck with the rest of the crew. At his memorial service Mayor Rudolph Giuliani called him "an American hero." Calabro spent his 14-year career as a firefighter at Ladder 101. "He was the senior man on the truck," said a colleague, "and one of the most respected in the company." He also trained all the firefighters. "It's a big loss," says Delgrosso. "He was an inspiration to a lot of people here." Keeping fit and working out was Calabro's passion. He played on several FDNY sports teams and coached his son's T-ball team. He was also a history buff. He and his wife, Francine, would have celebrated their 12th anniversary on Sept. 16. He was an "unbelievable dad" to Daniel, 4, and AJ, 2. 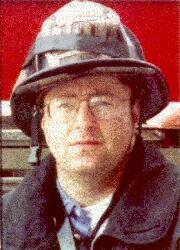 Thomas J. Kennedy, 36, was the son of a firefighter. Like Calabro, he spent his entire FDNY career at Ladder 101. "He was the chauffeur," says Delgrosso of the eight-year veteran. In addition to navigating the ladder truck through the streets of the city, Kennedy was very handy. A fellow firefighter referred to him as "Mr. Fix-it." Delgrosso agrees. "He fixed things up around the firehouse and was always willing to come over and lend a hand if you needed him." Kennedy and his wife Allison lived on Long Island, with their two boys, Michael, 3, and James, 1. A pleasant man with a good sense of humor, Kennedy loved kids and they loved him. He was a doting father who looked forward to expanding his family. Kennedy was an athlete who enjoyed outdoor sports, especially snow skiing, something he had hoped to someday share with his children. 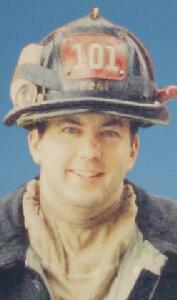 Patrick D. Byrne, 39, was assigned to Ladder 101 after graduating from the fire academy in 1994. "He was the practical joker of the crew," says a fellow firefighter. "You had to watch out when Patty was working, you might get soaking wet." Byrne was the 'king of the bucketeers,' and never missed dousing an unsuspecting colleague with a bucket of water poured from the roof. Delgrosso says Byrne was always up to something, and once "booby-trapped" the telephone. " He was a character," says Delgrosso, "but he was a real good guy, a good fireman." Byrne was the youngest of nine children. He was not married and had no children of his own, but was idolized by his many nieces and nephews. He lived on Staten Island. In addition to being a fireman, Byrne did construction work on the side. He played league softball, including the firehouse's own "Red Hook Raiders." 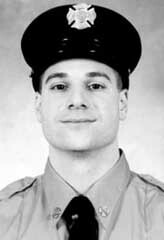 Joseph Maffeo, 30, had been with the FDNY since 1996 and was working a 24-hour overtime shift when the first plane hit. He was known as "Mr. Gadget" at the firehouse. "He was always trying to invent things to make the job easier," says Delgrosso. "He was always thinking, always moving." The company has recently begun using a device Maffeo invented to control a door during forcible entry. He was also studying to become a lieutenant. Before meeting his wife, Maffeo spent most of his time with his two closest friends from childhood. The trio was well-known in the neighborhood and remembered for the time they sawed the roof off a Cadillac so they could drive around in a convertible. Joey wasn't known as a romantic until he met Linda Dornes. When he was ready to settle down, he sold his share of a boat so he could buy an engagement ring. They were married in 1998. As much as he adored his wife, he was enamored with his infant son, Christopher, and would spend hours playing with him. Brian Cannizzaro, 30, was a two-year FDNY veteran and the son of a former firefighter. He was relatively new to Ladder 101, "but he was very promising, very outgoing," says Delgrosso. Another colleague says Cannizzaro was respected by everyone and always "did the right thing and said the right thing." A graduate of St. John's University, Cannizzaro was a football player and president of his fraternity. He was a caring individual with a big heart who befriended a shy, handicapped teen, and gave him his football jersey. He was also a romantic who swept his best girl off her feet. With their families secretly seated in the back of the theater, Cannizzaro and Jacqueline O'Mara took in the Broadway musical "Beauty and The Beast" from the front row. When the show was over, the prince proposed for Cannizzaro, who was down on one knee offering a ring he had hidden in his sock. They were married in March of 1998. Two years later they had a son, Christopher. Cannizzaro's body was recovered on Nov. 11. He was buried on Nov. 15. His younger brother is an FDNY candidate. His resolve to become a firefighter has been made stronger by his brother's death. Brian and his son Christopher. Terence McShane, 37, joined the FDNY in 1999 after 12 years as a police officer. He was at Ladder 101 less than a year and was due to be rotated soon. He was not scheduled for duty on Sept. 11, but agreed to switch shifts with a co-worker. "He loved the job," says Delgrosso, "and he was a good firemen." 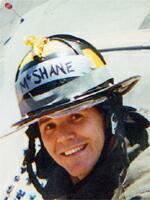 A colleague from Engine 202 says McShane was very 'gung-ho,' and had a great sense of humor. A rugby player since he was 14, McShane was a member of two state championship teams in college. A few years ago he and his wife, Cathy, moved to West Islip, N.Y. and bought a fixer-upper. The couple had a young son at the time and McShane planned to do much of the renovation himself. The arrival of twins boys meant the work needed to be completed much sooner. The family moved into McShane's childhood home in another town so the work could progress. They were still living there when tragedy struck. Friends, relatives and even strangers showed up at the couple's home. Within a few short weeks, the work that was expected to take several more months had been completed.